Footprints autumn season has begun. We are celebrating this year the 5 –year jubilee!! On the 16th of September joint work for families, for you and your friends! In various countries throughout the world there occurred tidying up works. We join and support that our Planet would become a bit cleaner. This action is the last one this season, where you will have opportunity to profit a free ticket to the Footprints Large Final Event, which this year will take place in the Ķīpsala Hall, on the 26th of September. Joint work will be carried out also in other towns, track information. Valmiera region Nauksenu rural municipality in Piksari at 12.00 – Project Footprints within the framework of the action of the International organization „Clean Up the World” – joint work on improvement of surroundings of Imeri park and Piksari Church. In Imeri park we will prepare a place for children playground, which creation is co-financed by the Valmiera Region Fund. All present and former residents of Piksari and “Piksari fans” are very welcome. Duration of the joint work - 3 hours. We’ll cut dry trees, improve campfire places, install information stands and arrange perennial flowerbeds, prepare places for swings, sand boxes and walking places. This year on the 16th September at 8.00 Gulbene town Council Improvement Department the Project Footprints within the framework of the International Organization „Clean Up the World”– invite you to take part in joint work on tidying up the territory of the former airfield in Gulbene town. We’ll mow green, cut bushes and gather household waste. Duration of joint work – 4 hours. There will be provided transport till Aloja Town Council. We guarantee the sense of fulfillment and joy for well spent day, since we'll tidy up something small, but still a part of our planet! Meeting at 12:00 at the stature Present to Next Millennium. Let’s breath fresh air, work together, sing! We’ll reward all hard workers! Riga region, Incukalns rural municipality, Egļupe (horticultural cooperative, located in the middle of woods), it is planned to tidy up the left part (it is in Sigulda direction), wood road runs along the Allazi rural municipality lime glen sources. The clean up operation will be concentrated on cleaning up the shoreline territory. Organized by "Piejūra" Nature Park Development Society Chairman of the Board, Kristaps Lūķis. Financial support generously provided by Latvia’s Zaļais Punkts. 7. Removing dry branches from trees and shrubbery. We will meet up outside the Stalbe Culture House. Bring your rake and your enthusiasm for hard work. Wishing us all success as we work together! We’ll clean up the sports areas on Skolas, Meža and Līvzemes ielas, the furrow on Dienvidu iela and the area around the Obelisk. We’ll await you at the clean up locations at 10:00. Around 12:00, you’ll be cheered by the arrival of the “baguette wagon”. We’ll finish work around 13:30 and will immediately be able to discover the pleasure of exercising on a sports field that you’ve just cleaned up! Moreover, we’ll also receive invitations to the concluding event within the Salaspils clean up operation at 19:00 at k/n “Rīgava” where a number of surprises will be in store …! Entertainment by Dj Michux. Time to clean up, time to relax in a clean city! September 16 – Jelgava Clean Up Operation! Where? – At Veselība Path, opposite Jelgava’s 6th Secondary School. How to get there? – Take the No. 5 bus to the 6th Secondary School (from the Railway Station at 11:18, from the Centre (By Čakste’s Monument) 11:20). About the event – During the clean up operation we will clean up the area by the Loku main road, the Veselības path next to the Bērzu Cemetery which is located in the territory of Jelgava. The clean up operation will also offer you the chance to take part in a rubbish collection competition, as well as various other interesting activities. Furthermore, this clean up operation will present the last opportunity to receive free tickets to the Footprints Finale Event! Thanks to „Crash bowling” participants will have the chance to gift vouchers for bowling and thanks to „Jelgavas maiznieks” and „Čilli pica” we’ll be able to enjoy a delicious lunch! We look forward to meeting you all at the clean up operation on one of last sunny autumn Saturdays! Registration from 11.00-11.45 – walking championship. Age groups ranging from the youngest to the most senior. Modris Liepiņš will compete against Aigars Fadejevs – let’s see which team comes out strongest. Muscle man Raimonds Bergmanis will put on a personal demonstration of his power. Opportunity to take part in an all-aged walking competition. Responding to an invitation from Project Footprints a clean up operation will also take place Talsi region Īve district with the participation of pupils and schoolteachers from Tiņģere Primary School and local district residents. We will clean up the Tiņģere Castle Residential Park, centre territory and sports field. The clean up operation will take place on 15.09. Free tickets to the Footprints 5th anniversary event that will take place on September 26 at Ķīpsala Hall – guaranteed! All you need to bring with you is a good mood. Clean up operation in Viļķene Parish. September 16 at 10.00, clean up task force member will be invited to meet up outside the Viļķene Culture Centre. We divide up into teams and set off for the clean up locations. Viļķenes Parish is the birthplace of the author of the Latvian national anthem Kārlis Baumanis, we will clean up the leisure spot next to Kārlis Baumanis’ monument \ at "Indriķi"'. We will also clean up the Viļķene children’s leisure and playground, then we will set off to clean up the bathing site\"Ozoli"\ by Lake Āstere. We will saw bushes, collect household waste and collect rubbish and set up bonfire places. Bring your work tools and enthusiasm for the job at hand. The clean up will begin at 13.00 at the Viļķenes children’s leisure and playground by the fireplace with general entertainment. The clean up operation is supported by Viļķene Parish Council. Featuring the participation of Viļķene Youth Centre. We invite others to come along and take part! Free tickets to the Footprints 5th anniversary event that will take place on September 26 at Ķīpsala Hall – guaranteed! Alūksne District Ziemeri Parish Council, the 29th Ziemeri cub scouts, schoolteachers and pupils, likewise other district residents have accepted the invitation from Project Footprints to take part in the campaign ,,Clean up the World’’. During this clean up operation, the leisure spot at Māriņkalns opposite Ziemeru Primary School will be cleaned up. Clean up operation work will begin on 15 September at 8.00 and will continue throughout the day. Leave ,,Your Footprints’’ in your school’s, your parish’s, your region’s clean up operation. 16 September, Koknese district, Aizkraukles area. An environmental clean up operations will take place as part of the Project Footprints campaign. Participants will meet up at the "Family Support Day Centre" at Koknese, on September 16 at 11.00. Let’s clean up the environment in which we live. Clean up operation starts at 9.00, meeting point: Mūrmuiža centre. We have decided to join the "Clean up the World" campaign, by organising a project supported by Valmiera Regional Fund "Miegupe’s Cultural-Historical and Landscape Park". The customary clean up operations will take place on September 16 at a residential location located in Valmiera district, Kauguru parish, Mūrmuiža. Let’s all succeed in leaving some green footprints. Joyfully - Aina Saleniece. On 16 September this year at 9.00 as part of the international organisation „Clean up the World’s” global campaign, Project Footprints will organise a beautification and clean up operation at the Pļaviņi City forest territory in the vicinity of the memorial stone to Pēteris I. The clean up operation will be completed by 12.00. 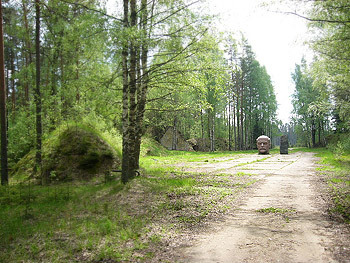 The clean up process on the territory will involve the sawing of dry trees, mowing grass, preparation of benches by the stone memorial to Pēteris I and the collection of household waste. Meeting place: 9.00 outside M.Brimmerberga’s Pļaviņi Secondary School. Clean up task force members will be transported by car to the location of the clean up operation where Pļaviņi City Culture Centre Director, Astrīda Davidova will give a short talk on the historical significance of the Pēteris I stone. 160 clean up task force members took part. 24 m3 collected. Thanks to everybody who took part!! See you at the Footprints Finale! 2 September, Riga – in partnership with the University of Latvia’s Faculty of Modern Languages. 200 clean up task force members took part. A total of 54 m3 waste was collected. Thanks to everybody who took part!! There were collected 32m3 waste, tidied up 12 ha territories. In the joint work there participated 130 volunteers. What was the most exciting thing that you found out in general or in this year Footprints activities? Further on you can be proud of it and compete with others. Come and join our next joint work and help to create a museum of “Wonderful findings” of the Footprints!!!! Take a hold of it and give it to the organisers of the joint work! At each joint work – most interesting and gorgeous exhibits shall receive great prizes – Gift Vouchers for relaxation at the „Ķeizarmežs” wellness and sports centre. THE FOOTPRINTS SUPPORTS AND RECOMMENDS! Let's go to Alūksne !!! On May 27 and 28, 2006 the Big Spring Joint Work 2 days camp for the clean up of the territory including many interesting activities is organized in Alūksne region, Zeltiņi rural municipality, in the territory of the former top secret strategic U.S.S.R nuclear weapon base We will have different events and surprise prizes. Welcome all who are enjoying active recreation in nature's lap. The signet of secrecy will be removed during the camping day. Within the framework of the undertaking it is planned to clear the former barrack zone out of environmentally unfriendly garbage and to tidy the visual sight of the barracks. The working ardour will be supplemented by different events following the awarding of winners at the end of the Joint Work. To go back mentally to the events that took place in the base the participants of the Joint Work will be offered free of charge excursion with the tour guide. You will see the sights of underground bunkers, big air sheds and rocket launching sites. In the evening friendly leisure and talk through of impressions at the camp fire. Overnight under canvas (tents taken along with you!) at special camping place. All working tools and transport for garbage removal from the territory of the base will be provided. Gathering and occupation of tent places on May 27 from 9:00 to 10:00 a.m. The Opening of the undertaking at 10:00 a.m.
Sign up for the Joint work: telephone 6340504 (Baiba), 9453122 (Ainars), or e-mail: baiba@mauricas.lv. Those interested who do not apply till the day of the Joint work, shall arrive with their own working tools. Support from: Zeltiņu rural municipality; Project Footprints (Riga); Zeltiņu civil parish school; Hotel "Dolce Vita" (Riga); Alūksne mobile riflemen battalion, Alūksne TIC, Alūksnes Ziņas (Alūksne News); Malienas Ziņas (Maliena News); etc. There were collected about 42m3 waste and in the joint work there participated 260 volunteers. There were collected 32m3 waste, tidied 7 ha territories at Riga borders and the Strazdupite Brook. In the joint work there participated 350 volunteers. There were collected 40m3 waste. In the joint work there participated 160 volunteers. Supported by Latvian Environment Protection Fund. There were collected 48m3 waste. In the joint work there participated 650 volunteers. LU students joint work, participated groups Astro’n’out, Lietotas mēbeles no Holandes /Second Hand Furniture from Holland/ and BackYard. There were collected 40m3 waste, tidied up 5 ha territories. In the joint work there participated 150 volunteers. 29th April - Riga, Jugla Lake vicinity – family joint work! In cooperation with Zaļs Punkts and Draugi.lv, and RIMI. There participated a popular German singer Brandon Stone with friends. There were collected 40m3 waste, tidied up 4 ha territories. In the joint work there participated 250 volunteers. There were collected 24m3 waste, tidied up 6 ha territories. In the joint work there participated 380 volunteers. Joint work dedicated to Latvian Republic Independence Declaration Day. In the joint work there participated an Olympian Mārtiņš Rubenis.There were collected 40m3 waste, in the joint work there participated 170 volunteers. We have planted 2 ha with pine trees. THANKS to everybody (residents of Riga and Jelgava)! 8th May – TALSI. Supported by Latvian Environment Protection Fund. In cooperation with RIMI. There were collected 8m3 waste, in the joint work there participated 90 volunteers. Special guests – a group Morning After. There were collected 24m3 waste, in the joint work there participated 100 volunteers. There were collected 12m3 waste, in the joint work there participated 30 volunteers. There could be changes in the Joint work schdule!!! Follow the information in the home page!!! This (2005) year the Footprints have organized 14 waste-collection bees in Latvia cities, mostly in Riga – capital city. In total approximately 600 m3 of waste was collected. In the clean-up actvities approximately 4000 pupils, students and school children participated. Daugava bank - 32 cu. m. of garbage collected! THANK-YOU TO ALL WHO TOOK PART IN THE ACTIVITY!!! Gailezers - 24 cu. m. of garbage collected! Melluzi - 14 cu. m. of garbage collected! The shore of Jugla Lake - 32 cu. m. of garbage collected! Anninmuiza - 21 cu. m. of garbage collected! Ziepniekkalns - 64 cu. m. of garbage collected! Liepaja - 40 cu. m. of garbage collected! The shore of the Daugava Lake - 42 cu. m. of garbage collected! The shore of Jugla Lake - 40 cu. m. of garbage collected! Ziepniekkalns - 62 cu. m. of garbage collected! Bullupe shore - 32 cu. m. of garbage collected! Smerlis forest - 64 cu. m. of garbage collected! 30 April at 10.00 Babelites Lake - 32 cu. m. of garbage collected! Mezaparks - 56 cu. m. of garbage collected! Joint work in the Smerlis wood - 12 cu. m. of garbage collected! Joint work in the Mezapark - 15 cu. m. of garbage collected! Joint work on the Daugava bank - 33 cu. m. of garbage collected! Joint work in the Ziepniekkalns - 38 cu. m. of garbage collected! Joint work on the Bullupe bank - 25 cu. m. of garbage collected! The Footprints opened their autumn season at a garbage collection bee in Liepaja! world champion in arm-wrestling Evita Ivbule. Raimonds Vejonis, Minister of Environment, participated at the bee with us. This year the Footprints have left their imprints in 11 waste-collection bees. In total approximately 245 m3 of waste was collected. In the Smerlis Forest, in Mezaparks, on the banks of the Daugava, in Ziemelblazma, in Ziepniekkalns and Dzeguzkalns. On the banks of Lake Jugla, in the Anninmuiza Park, on the banks of the Bullupe and in Mangalsala. In total 11 waste-collection bees were organised in Riga. In addition: 2 bees took place outside Rīga. Within the programme of the Europe Days, on 5 May we collected waste in the Sampetera Park in Riga, as well as at the Ventspils University College and in Liepaja. The Olympians Sandis Prusis and Dainis Kula secured youthful spirits. In the years 2002 and 2003 the Project Footprints organised 22 waste-collection bees, thus tidying up 22 territories and removing 780 m3 of household waste from parks and forests. 2600 students and pupils from 14 higher educational establishments and 15 schools throughout Latvia attended the Project.